Opera houses—temples to the art of Mozart, Verdi, Tchaikovsky, and more—have been created by some of the most talented architects and designers of their generations, inspiring centuries of veneration from audiences, filled with royalty and commoners alike. 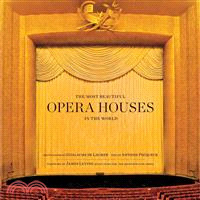 In this sumptuous book, photographer Guillaume de Laubier and journalist Antoine Pecqueur explore more than 25 of the world’s most beautiful opera houses, from Tokyo to Covent Garden, from Oslo to Chicago, from Milan to New York. The buildings are described in their historical contexts, while stunning photography reveals the theaters’ most captivating spaces. In addition to offering sweeping views of ornate auditoriums and facades, the book opens doors normally closed to the public, entering the artists’ dressing rooms, rehearsal halls, scenery workshops, and more, presenting a wide-ranging and compelling look into a spectacular world. Guillaume de Laubier, a photographer who has regularly contributed to Elle Decor, Vogue, and Maison Francaise, is the author of several books, including Abrams’ The Most Beautiful Libraries in the World. Antoine Pecqueur is a journalist for Le Monde, the French television channel Mezzo, and the classical music periodical La Lettre du Musicien.